Work on the Ajax continues. 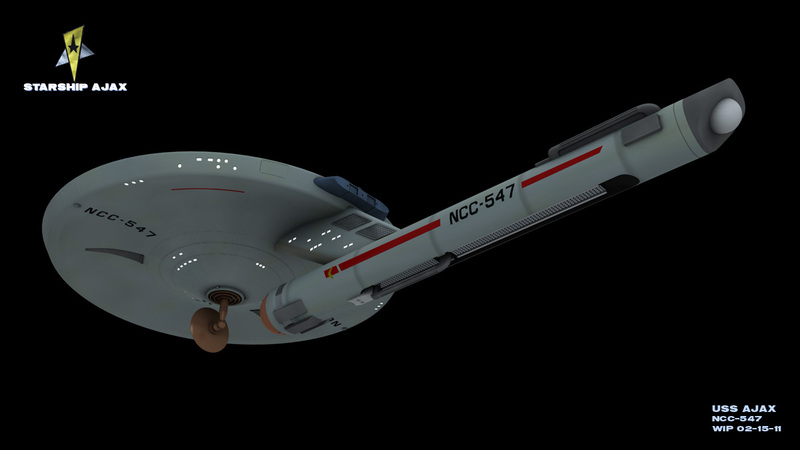 Have just about nailed down the modelling, finally wrapped my head around UV creation and made some headway on the textures. The texturing has been 'interesting' from a reference standpoint. 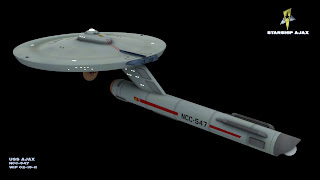 The aim has been to emulate the look of the 11 foot Enterprise miniature from the original series. Reference material is available but most of it is of the refurbished model as it hangs in the Smithsonian today - the refurbishment having altered the model from it 60's condition, or else photos of the disassembled model just prior to refurbishment which suffer a little in the lighting and film department. 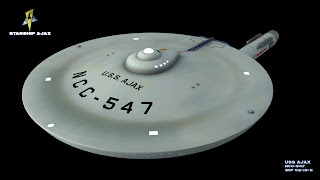 Luckily, the colour of the Enterprise has proved a major research subject for scale model enthusiasts trying to paint their Enterprise miniatures - they have managed to narrow down the original colour and provide colour samples of modern equivalents on which to base the textures. The grid pattern on the saucer is a matter for debate. 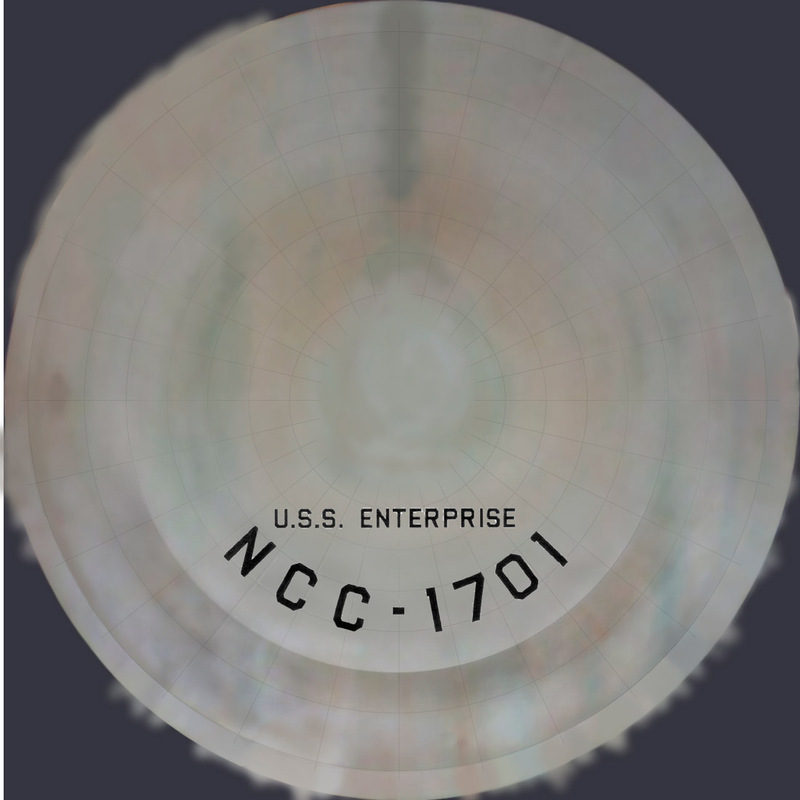 The original model as delivered to Desilu was grid-less, but the pattern appears to have been added to aid in optical compositing of effects. The optical process washed out the grid so it was not visible on screen. Since the goal is to recreate the look of the 60's effects, the grid has not been included at this point. A lot of CG Enterprises - including the Defiant seen in 'Enterprise' - have also added the azteking pattern - the specular paneling - seen on the Motion Picture refit which was not a feature of the classic TOS look. There will be some specularity to reflect the original paint, but no azteking on this version. Nice work on the Ajax. 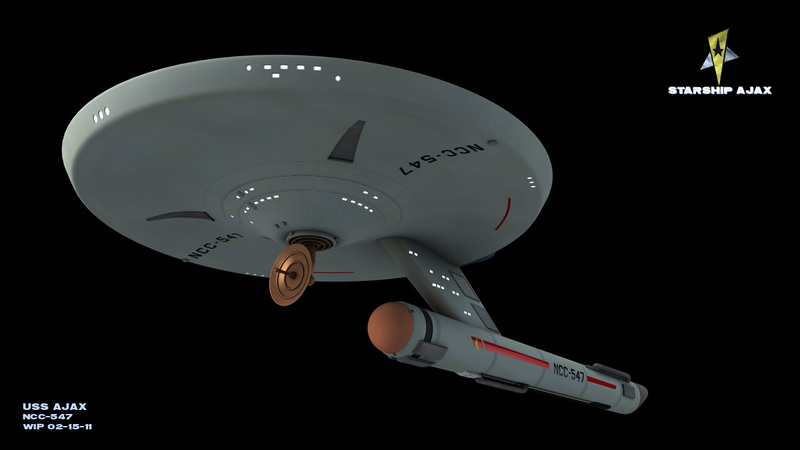 The Saladin-class is a personal favorite of mine. You're right, the texturing is not easy. However, it looks like you're doing a great job so far. BTW, you can see just a hint of the grid on a few effects shots, you just have to look very closely. Looks like the grid is in then. HDTV, hi-def computer monitors and the episodes on DVD help you to see the grid lines. Without all of that, I don't think I ever noticed them.